When Stratus Dancer is turned face up, counter target instant or sorcery spell. Beast Whisperer and Primordial Sage 100% deserve spots. Stratus Dancer , Den Protector , and Ainok Survivalist too. Nice job upgrading this thing. I do still have a few suggestions though. First, Glimpse of Nature ... then Spellseeker to look it, Cyclonic Rift, etc. up. Equilibrium and/or Temur Sabertooth as backups to Cloudstone. Tishana, Voice of Thunder instead of Zegana. Much easier to cast even if it draws less cards... that double blue and green is tricky. Stratus Dancer instead of one of your non-creature counterspells. Also consider Draining Whelk . Earthcraft is also crazy good here. There's 2 of your categories that need the most work... card advantage and ramp. Rocks needs to disappear altogether because neither your ramp or rock sections are how you want to ramp in Animar. 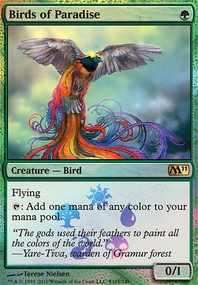 Use mana dorks like Birds of Paradise , Shaman of Forgotten Ways , Rishkar, Peema Renegade , Somberwald Sage , and guys like Sakura-Tribe Elder and Wood Elves (many more options). 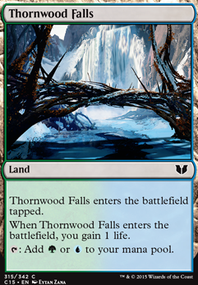 The only card I'd keep out of rocks/ramp is Utopia sprawl. 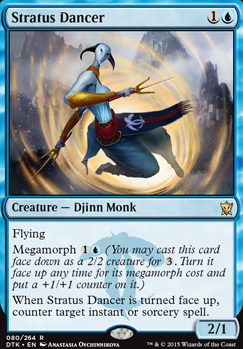 Card Advantage I'd switch Fathom Mage for Beast Whisperer. 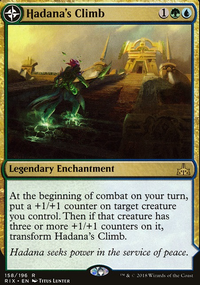 Urban Evolution and Rishkar's Expertise are really bad here, you can do a lot more with that much mana. Primordial Sage , Tishana, Voice of Thunder , Momir Vig, Simic Visionary , and Vizier of the Menagerie are all much better options. I'd also switch your counterspells for creature versions like Stratus Dancer , Draining Whelk , Siren Stormtamer , and/or Glen Elendra Archmage . Animar is unique in the sense that general deckbuilding rules get thrown right out the window. In Animar you want about 15 non-creature spells in the deck tops (I run only 12 lol) with almost all your utility on a creature. I.e. Glen Elendra Archmage , Siren Stormtamer , Stratus Dancer , and/or Draining Whelk for counterspells. 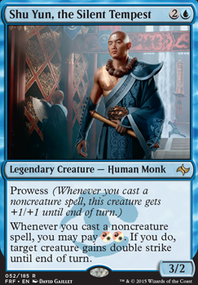 Mana Dorks, Sakura-Tribe Elder , and Wood Elves for mana ramp etc. 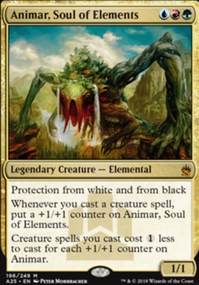 Also, most Animar decks focus a lot on bounce so you can abuse your own etb triggers over and over. Consider Cloudstone Curio , Equilibrium , Temur Sabertooth , and Tidespout Tyrant . These work especially well with cards like Cloud of Faeries , Peregrine Drake , Stadium Vendors , and morph/colorless eldrazi creatures. Combo Pieces/Bounce Targets: Cloud of Faeries , Great Whale , Purphoros, God of the Forge , and Walking Ballista . Board Protection/Interaction: Stratus Dancer , Draining Whelk , and Heroic Intervention . Nice deck. I do have a few suggestions though. I'll try to break it down by category. Card draw: Primordial Sage and Tishana, Voice of Thunder . Bounce Enablers: Equilibrium and/or Tidespout Tyrant . Both can be used to bounce opponents stuff also. Turn 2 Animar: Exploration and Wild Cantor . Haste Enablers: Ogre Battledriver and Urabrask the Hidden . Turns all your mana dorks into cloudstone combo pieces and immediate threats. Board Protection/Interaction: Draining Whelk , Stratus Dancer , Glen Elendra Archmage , and Heroic Intervention . Last is Spellseeker to look up Cyclonic Rift, Glimpse of Nature, Pact of Negation etc.